Is it a coincidence that two of history’s most legendary beauties both came from Ancient Egypt? I think it’s fitting, since theirs was a culture that thrived on aesthetics, and considered even death to be a thing of beauty. The Ancient Egyptians were the first people to elevate writing, drawing and sculpture beyond essential trades to true art forms. It’s interesting that these two women would be the most recognizable Egyptian queens. They lived and ruled 1300 years apart, and were quite different in many ways. It would make more sense to compare Nefertiti to Hatshepsut - the first and longest reigning female pharaoh. Cleopatra technically belongs among the likes of Helen of Troy, for she was actually of Greek descent. She was the last pharaoh of Egypt, ruling after the time of Alexander the Great. Though she came from Greece and associated with Romans, Cleopatra embraced the culture of Egypt, and was one of few royals to learn the language. There were so many wonderful illustrations inspired by Nefertiti and Cleopatra, that I couldn’t possibly show them all here. 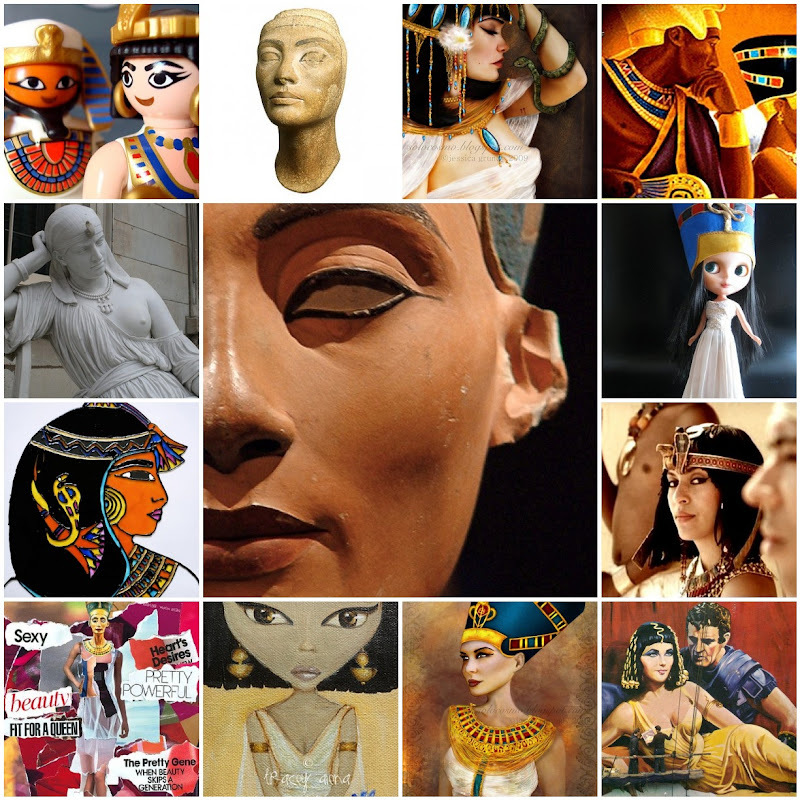 You can see more favorites in a gallery of Nefertiti and Cleopatra deviations. Which Egyptian queen is your favorite? Another week has come and gone, and I am enjoying this bracelet challenge more and more. I had no idea that I could relish making new bracelets so much. Having this motivation not only helps me to come up with new ideas, but adds to the excitement of trying them out. This week, I wanted to experiment with a technique I haven’t used in ages - graduated tubular herringbone. The very first time I ever attempted it, I was limited to just three seed bead sizes, and it didn’t turn out as well as I had hoped. 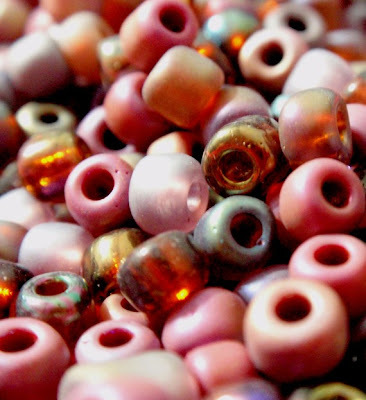 Now that my bead stash is a little more sophisticated, I thought it was time to revive the stitch and see what happened. In order to get a really broad range of bead sizes, I wanted my base to be smaller than an 11/o, but 15/o seed beads seemed much too flimsy for the job of holding up bigger herringbone bobbles. So I went to delicas to start my palette, and chose a tube of lovely matte transparent grays. Since it was coming up on Easter weekend, I added different sizes and shapes of beads in cool pastels to go with the gray. 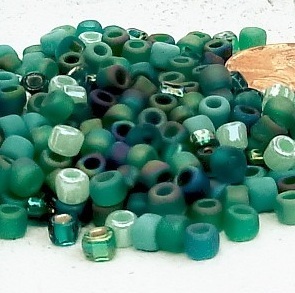 Normally, I really love to photograph my bead picks in their little cups, but there are far too many to capture in this palette (I just didn‘t feel like spilling them all out at once). Instead, I thought I’d share a rare glimpse of my actual beading station, moments before I began working on this bracelet. The palette includes: 11/o wisteria lined crystal, 11/o opaque lustered turquoise, sapphire lined light sapphire Miyuki triangles, 8/o dichroic lined cornflower blue, 8/o fuchsia lined aqua, 6/o Czech ceylon pearl, 6/o Miyuki purple lined crystal AB, 4mm opaque gray lined cubes, and 4mm light jonquil lined aqua cubes. 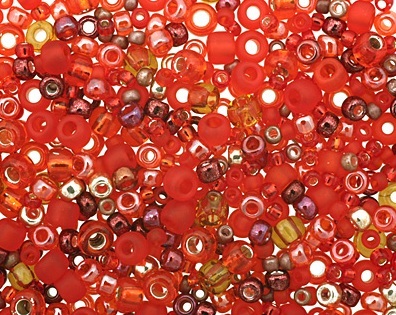 I later added some 8/o raspberry lined crystal beads as well. 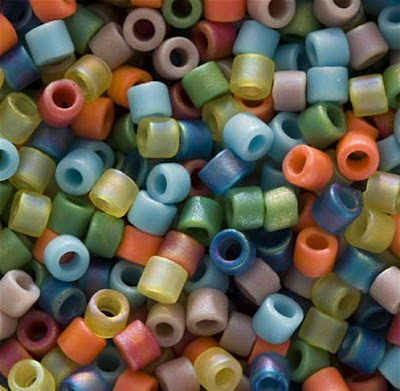 It was so fun to have all of these beads laid out on my tray at one time, especially because I almost never get a chance to use delicas or cubes, and they all looked so pretty in their little cups and coasters. The bead tray I use is actually the lid of a veggies and dip container, and at about four bucks, it’s one of the best beading investments I’ve ever made. The round shape is especially handy for projects like this one, because I can place the beads along the outer edge, and rotate the tray for easy transitions. I was a little worried halfway through the first increase that the bobbles would be too boxy thanks to the cubes at the center, but they rounded out again as the beads decreased, and I love the shape. Sizing was a bit of a hassle, and it took a lot of pondering to decide where to stop to get just the right length. Unfortunately, I wasn’t able to finish the pattern as smoothly as I would have liked, but I’m still happy with the bracelet overall. It actually turned out a lot more sophisticated than I had hoped it would. 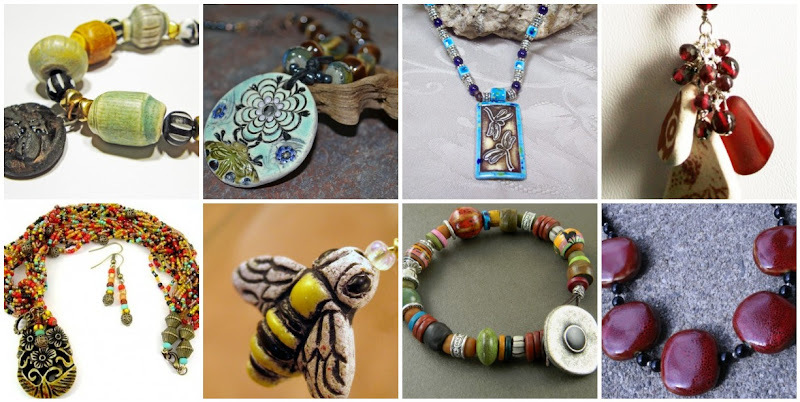 Some trends come and go, but it would seem that upcycled and repurposed jewelry is here to stay. This is good news, and not only because of the way this craft keeps things out of the landfill. 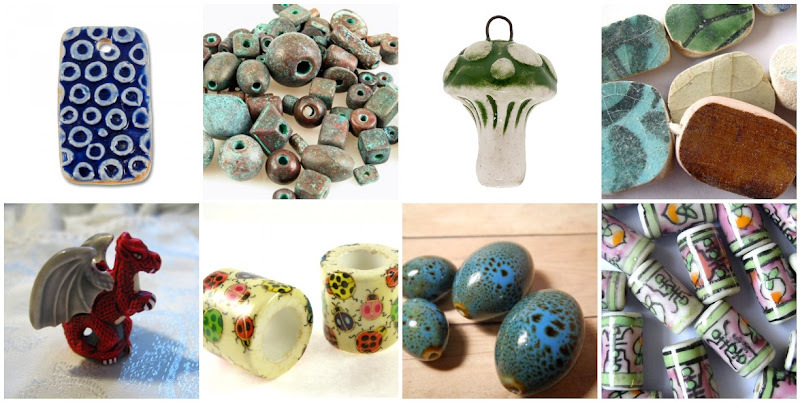 Preserving objects from the past, and making something new out of something old, is a rewarding practice with beautiful results. Although I stay away from wire and chain work, I long to take apart old jewelry and make it my own. It’s probably lucky for me and my wallet that there are no flea markets within shopping distance. I could spend a lot of hours looking through cigar boxes and trays of forgotten jewels. 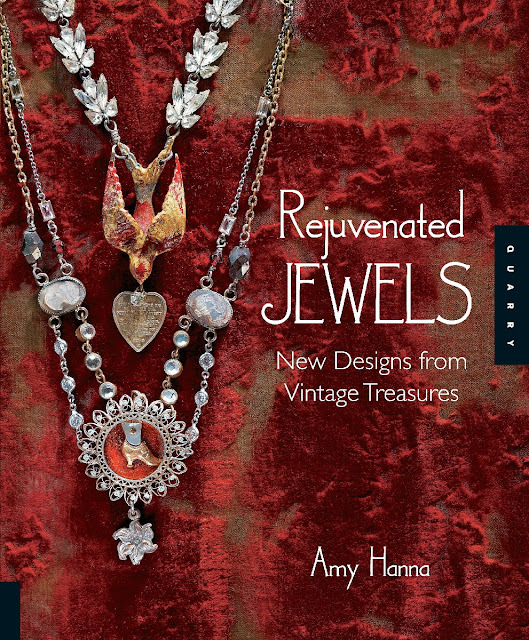 When I picked up a copy of Rejuvenated Jewels by Amy Hanna, I expected typical craft book projects that would provide a little inspiration. I did not expect to be glued to the pages, and practically drooling over the designs within. This book ought to come with a warning label: Caution, May Incite Uncontrollable Bargain Shopping and Attic Rummaging. 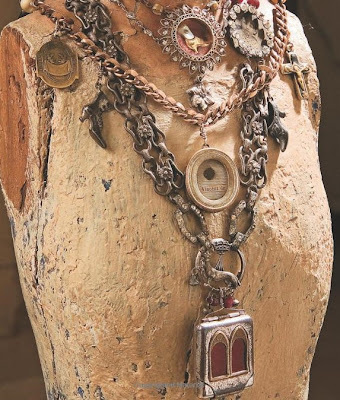 After an in depth look at some of vintage jewelry’s most precious components and qualities, basic materials and found objects, Amy gives readers an introduction to preparing both new and old jewelry components for designing. Step by step tutorials with clear diagrams also explain some jewelry basics like wrapped loops and crimping. 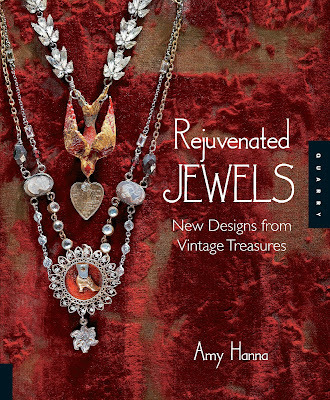 The following five chapters are filled with gorgeous and intriguing jewelry designs, made with everything from vintage photographs to military ribbons. 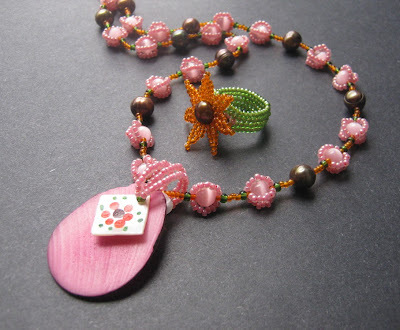 There are 36 necklace, bracelet and earring projects in total, each with a complete materials list and instructions for making your own variations. 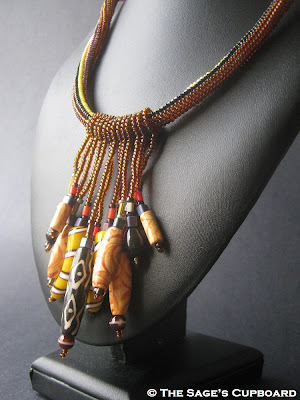 Most of the designs are simple and straightforward, and provide an excellent guide to designing jewelry from found objects. There are no step-by-step photographs for the individual projects. 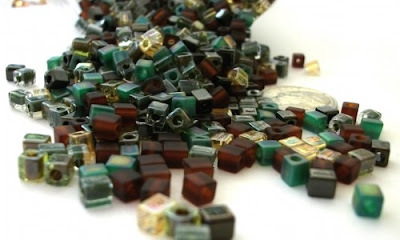 Absolute beginners to the world of jewelry making may want to practice on newer, more replaceable materials and objects before attempting to drill, file and rejuvenate rare finds. 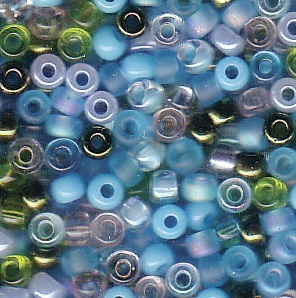 I can’t speak for all beaders, but personally, I don’t really like working with seed bead mixes. When I'm planning a design, the colors and shapes that I select each have a specific job to do, and sorting through a mix just isn’t that fun. 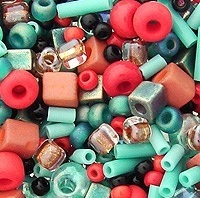 If I do want an assortment of beads, for a spiral or freeform piece, I like to make my own. 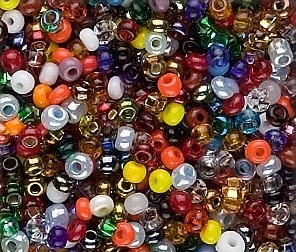 So why is it that I am so drawn to bead mixes? Every time they appear, I want to have them for my own. 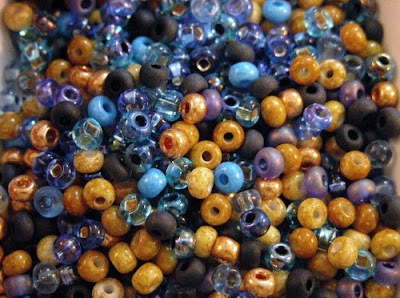 Perhaps it’s the explosion of color, which ignites creativity, or the illusion of vastness that an assortment of beads creates. 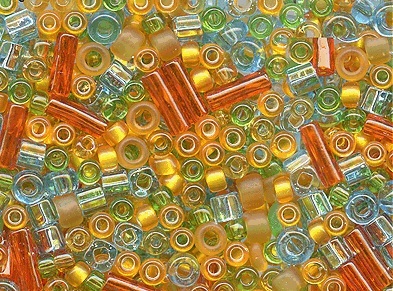 Do you like to buy pre-mixed beads, or come up with your own unique concoctions? What’s your all time favorite color combination? This week’s bracelet is very special. 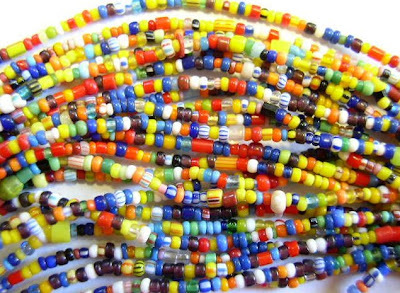 Earlier this month, I got word through Twitter that Lori Anderson of Pretty Things was hosting a blog hop challenge, inviting beaders and designers to create a bracelet for the Global Genes Project’s 7000 Bracelets for Hope campaign, and I happily got on board. The purpose of the campaign is to show support for families that are affected by rare disease, and of course to help raise awareness about Global Genes and their efforts. I found it very exciting that Lori’s challenge would fall into my lap while I was doing my own bracelet challenge. It was meant to be. All I had to do was push back my ideas by one week, and come up with a design using a blue jeans theme. I hadn’t planned on repeating any designs so early in my challenge, but inspiration really took over this time. 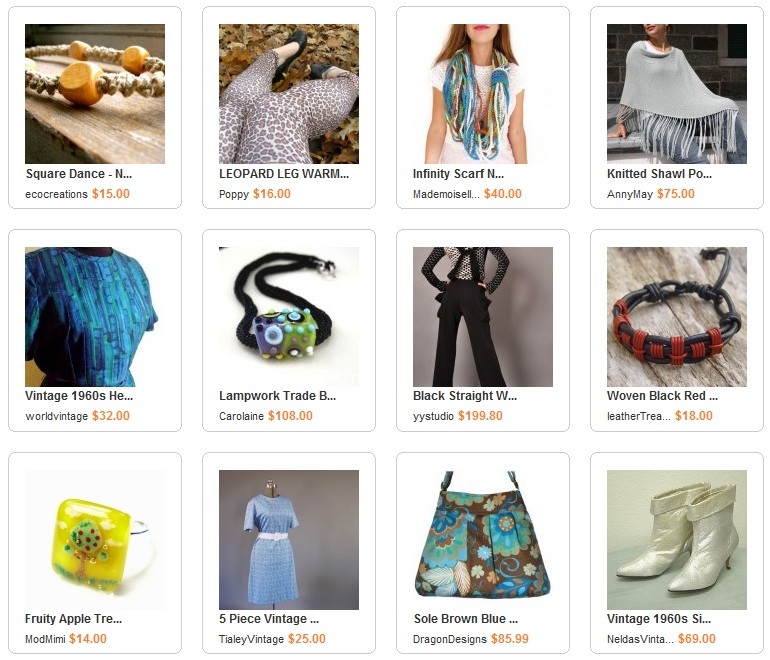 As I was pondering what to make, and how to recreate the look of denim, I kept seeing hints of copper (buttons and grommets and zippers) on dark blue. 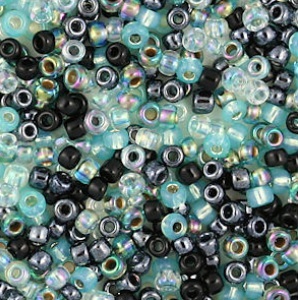 I went through my bead stash, and picked out some very denim-like blues - abalone lined crystal and dichroic lined cornflower. I don’t have any metal beads or components, so I had to come up with another way to add that hint of orangey brown that I kept seeing in my imagination. 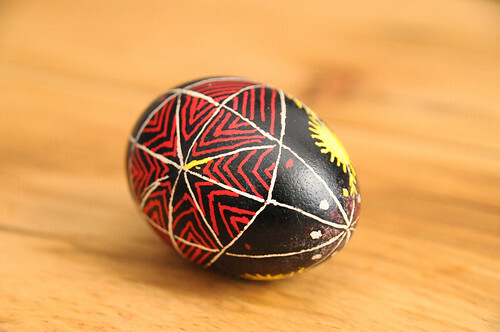 I was really drawn to the patterned wood rounds that I use to make big brick stitch buttons and flowers. As soon as I put the beads together, I saw a big blue flower bracelet, like my Spring Corsage from week three. The bracelet turned out so nice, though I sort of wish I had used a third blue for the flower. 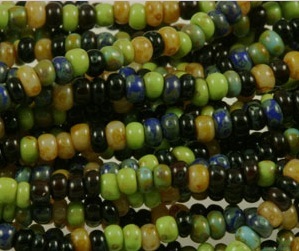 This time I added more wood beads to the bracelet band, and I love the contrast of color. I’ll be mailing this one out right away, and I hope that it can help its new owner smile. 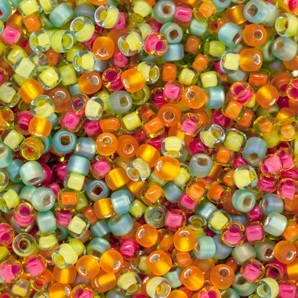 Stop by Pretty Things to see the complete list of participants in the 7000 Bracelets for Hope Hop - there are over 100 of us! 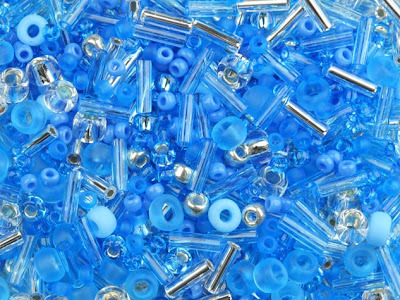 If you missed out on the hop, but you would still like to contribute, visit the Global Genes website to learn more about making and sending your own blue bracelet. On a side note, I have also completed the jewelry sets that I was making for some fundraisers closer to home. 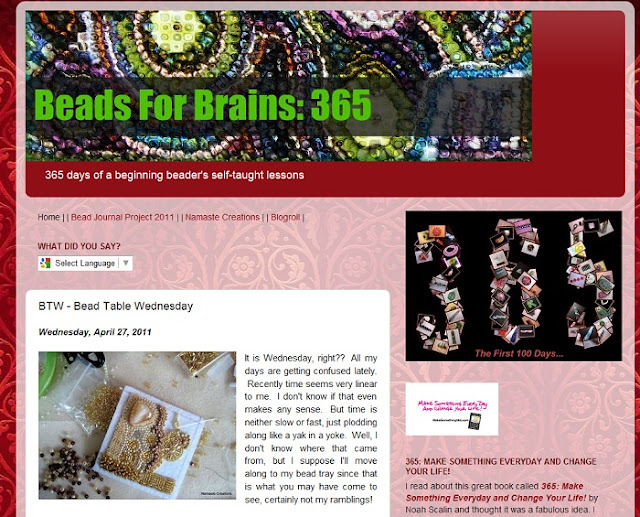 Earlier this week, I shared my first attempt at mixing pink and orange with green and brown. I was able to make it work, and finished the pendant, plus a ring to go with it that almost matches. I ended up adding a new shade of green for the ring band - I don’t think pink would have looked quite right. I also talked about color palettes that don't need any extra help to get along - the second set is one example of those. I do love the sweet and sour combination of green and purple. One of my favorite things about the ability to create, is being able to give my time and energy to causes that matter to me, and know that it will help in some small way. What’s the most amazing or warm and fuzzy thing you‘ve ever done with creativity? I’d love to hear your story!